Apple posted record revenues for the holiday quarter. But it was the fate of the iPhone X that had distressed analysts and journalists trying to resolve a growing disconnect. On the one hand, reports had pegged the iPhone X as the world’s best-selling smartphone in the holiday quarter; on the other hand, Apple was ramping down production of the device for the current and future quarters due to lower than projected sales and higher inventories. Apple’s earnings report for the recent holiday quarter was highly unusual and complicated. 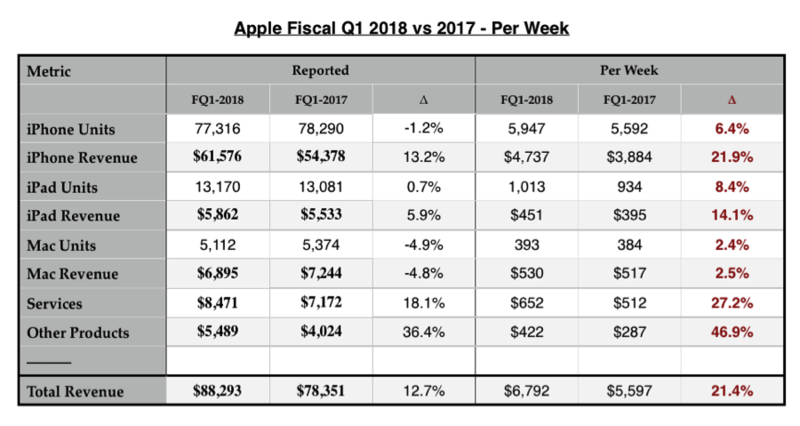 iPhone sales were down, but with an asterisk: This quarter had 13 weeks, rather than 14 weeks like last year. Yet … revenues still fell short of analysts’ expectations. Yet … the company still saw a big bump in iPhone revenue and average selling price. “iPhone X was the best-selling smartphone in the world in the December quarter, according to Canalys, and it has been our top-selling phone every week since it launched,” he told analysts. Cook added that the “iPhone 8 and iPhone 8 Plus rounded out the top three iPhones in the quarter. In fact, revenue for our newly launched iPhones was the highest of any lineup in our history, driving total Apple revenue above our guidance range.” The result is that Apple guided to between $60 billion and $62 billion in the quarter, below analysts’ estimates of $65 billion. That means Apple’s revenue might only grow up to 17 percent from the same quarter a year ago — a “problem” literally every company on the planet would love to have. ASP for the iPhone was $655 in Q2 2017. As the following tables show, there were 77.3 m iPhones shipped including 26.2m iPhone X’s, Y/Y up 1% in units and 13% in revenue.